4th Bn, The Worcestershire Regiment, 88th Brigade, 29th Division, M.E.F. Next of Kin: Son of Mr George Goodyear of Bellars Lane, Malvern, later of 2 Conway Villas, Wilton Road, Great Malvern; fiance of Miss Alma Lansley of the Tally Ho Inn, Broughton, Hants. John Goodyear was born in Norton, the son of George Goodyear, one of four brothers. He was a member of the Worcestershire Regiment, and was sent overseas to the 3rd Battalion early on in the war. During the heavy winter of 1914 he along with thousands of others spent a bitterly cold Christmas in the trenches. In January he was sent to the Military Hospital in Newcastle-upon-Tyne suffering from frostbite and exposure. On recovery his in March he joined the 4th Battalion, which was sent to Gallipoli the following month. He was mortally wounded during the Battle of Krithia and died on the 7th May 1915. He was mentioned in dispatches for brave conduct during the battle. His three brothers also served in during the Great War: William served as a Sergeant in the 1/2nd South Midland (later 241st) Brigade, RFA; James Henry served with the Monmouths and was killed on the 13th October 1915; and Albert Edward served with the South Wales Borderers and was a Pembroke Dock at the time of John Goodyear’s death. 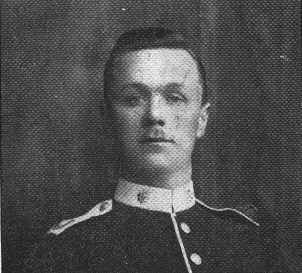 Before the war Jack Goodyear had become engaged to Miss Alma Lansley of the Tally Ho Inn in Broughton, Hampshire. Tidworth, where the 3rd Worcestershire Regiment were stationed before the war, was only a short cycle ride from the village and it is presumed they met either at a local dance or when he visited the pub. In October 1918 Miss Lansley married, by coincidence, a local man called Reginald Goodyear. Although a close family connection can’t be proved, an earlier Malvern Goodyear had come to the area to work at the then well known racing stables at Chattis Hill, near Stockbridge, Hants, no more than a mile or so from the village of Broughton. So perhaps there was a connection? Tragically, one of their sons, Howard Reginald Lansley Goodyear (known as Bobbie), was killed in northern France on 6th September 1944 whilst serving with the HQ, 11th Armoured Division, Royal Armoured Corps. The family did not know that Alma Goodyear had been engaged in 1915, but she had given the engagement ring to a grand-daughter on her birthday, saying it was “from someone very special to her that didn’t come back.” It is only now that they know it was given to her by John Goodyear of Malvern.